When I ordered my first shipment of Demeter minis, one of the things I got was Leather, which I finally got around to reviewing earlier this year. When I was figuring out what I should order in the second batch, I realized that not only did Demeter have three other leather scents, but that I very much wanted to try them. I'm not some kind of leather madman; I don't own a single item identifiably made of it, other than a couple of ordinary business-dress belts. (Jim has a very nice black leather jacket which I've never worn.) But I do like the smell of it, and if Leather was a good black-leather scent, then surely Riding Crop, Russian Leather, and Saddle would be good as well. Unfortunately, I only really like one of them. But I really like it a lot. Saddle is recognizably leathery, but with a plasticky overtone, as if it were leather-scent-impregnated naugahyde or leatherette. It's not bad for what it is, but I don't think it's the sort of thing to make real leather maniacs cheer. Riding Crop has an unexpectedly sweetish character, a little like synthetic fruit candy, but only a little. It also has a suggestion of solvent, almost like dry-cleaning fluid. I think I expected some sort of viciousness, given the sorts of uses that a riding crop might be put to, but it's not here. On reflection, I'm not sure why Riding Crop and Saddle would even be expected to smell different from one another, since they're both made of the same thing, and both applied to horses, but there isn't a particularly horsey or barny smell to either of them. They just smell, subtly differently, like synthetic leather. 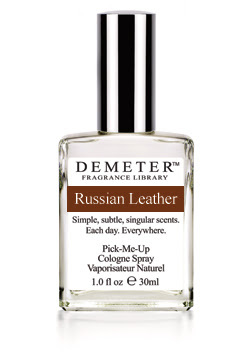 Russian Leather, according to the Demeter website, is the smell of old leather armchairs in a Viennese library, with "the sweetness that can come only from age". Yet to me it smells less sweet than Riding Crop. Instead, what it smells like is something intoxicatingly unreal; it is as if, walking through a garden at nighttime or on an overcast day, you came across a flower that was made, from stem to sepal, entirely of leather, sprouting from the earth like any other. There is a deep, dark floralcy to the Russian Leather, but it doesn't smell like flowers; instead, it's as though the flower and the leather were somehow the same thing, an amalgam, a hybrid of animal and vegetable. It is such a peculiar thing, and so inexplicably beautiful. I thought you'd be interested in reading this first-person account of anosmia on Slate.com. Anosmia is the acquired or congenital inability to smell. I can't quite allow myself to imagine what it might be like to live with that. I hope I never find out. In early June I wrote about Demeter Grass and said I'd never smelled any fresh-mown grass that resembled it. But now I have! We were heading back with groceries one morning early this week--Jim was on vacation, I had the day off, and were on foot, as always, because we don't own a car--when I caught the smell of something that was kind of like mowing, but not quite. I couldn't place it at first, until I realized, "Oh, hey--that's Demeter Grass! That's just what it is!" I still don't know quite what I smelled; maybe someone had just mowed a lawn that wasn't the usual grass, or maybe someone had spilled a shipment of Demeter, but it was out there, in the real world, and it was pretty nice. The Demeter Humongous Minis, by the way, have gone up from $5 to $6 each. They're still worth it, but I'm glad I got a whole bunch of them before the price increase. 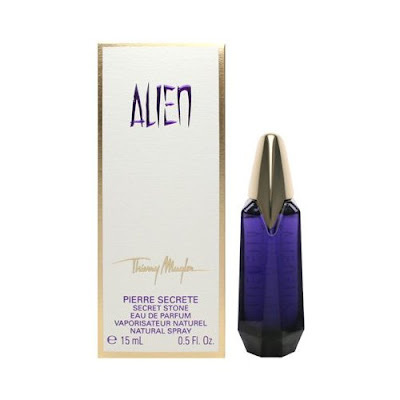 When I first smelled Thierry Mugler's Alien at its launch in Canada, I thought, "I could definitely wear this." When I saw it in London last year, I thought, "I have to buy this." 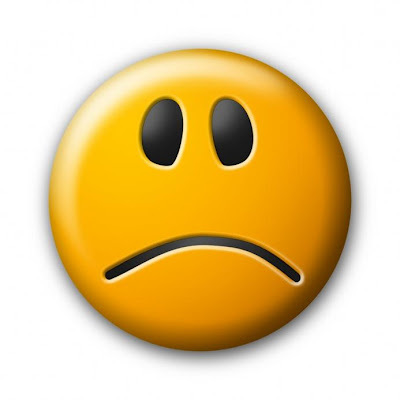 And when I tried it on after getting back home, I thought, "I have made a mistake." This was at the time of my dysosmia, when some scents--quite a few of them--smelled strange to me; all of those that did, I surmised, contained a particular scent element (or one of a family of such elements) that simply took over and left me smelling little but a strong, sharp, plastic-greenery aroma, not only at the time but for hours afterwards. That still happens from time to time, but it's not as frequent as it was; it no longer happens with Alien, for one. 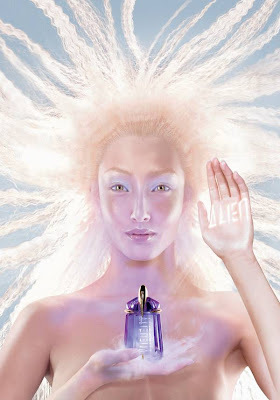 Alien is based on jasmine sambac, otherwise known as pikake, a very dense, heady tropical floral. This is the same jasmine that's used in Dior's Hypnotic Poison, which a great many people love but which is, for some reason, unspeakable on me; thick, heavy, suffocating. Alien suggests Hypnotic Poison with the horror-show elements removed. It opens with a little jab of sugar-frosted greenery which is immediately, and I mean immediately, joined by a huge plume of jasmine sambac. It's so big that it has a kind of authority which it can confer on the wearer; despite that wispy woman in the ad above, it's easy to imagine someone wearing Alien stomping around with a don't-mess-with-me scowl. (You can't do that in Anais Anais or Allure Homme and be taken seriously.) Sweetened and vanillified a bit, but not enough to make it gloppy or pretty, it closes with soft woods and more vanilla. It lasts, as you can well imagine, for hours and hours. And hours. If you're going to wear Alien, or even just try it out in the store, please, take it from me: do not overdo it. It's potent stuff. Even in a marketplace full of potent things, even next to its older sibling Angel, it's very strong. But in moderation, it's amazingly beautiful. If you've ever used one of the bath products in a fragrance line, you've probably noticed that the smell is never quite the same as the original scent. The oil in lotions, body creams, and after-shave balms tend to put a damper on the top notes, weighing down the lighter molecules and allowing the middle and base notes to take precedence. Shower gels and deodorants add their own manufactured aromas to the scent, altering it in unpredictable ways. And soap always smells, yes, soapy. Perry Ellis 360 Black for Men is almost a terrific scent, but it's hard to tell what it's supposed to smell like from the set I have. 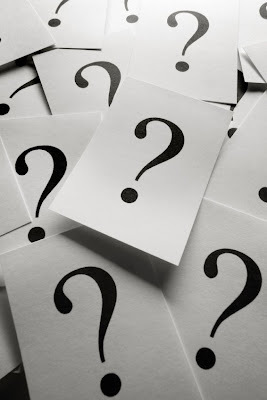 There are four products; a deodorant, an after-shave balm, a 100-mL spray bottle of eau de toilette, and a quarter-ounce travel spray of the same EDT, and all four of them smell different. The deodorant hardly registers at all as a scent. (No, I didn't jam my nose into my own armpit: I spread a little on my arm.) I don't really know what the point of it is, except as a deodorant, which role it fills very well. The after-shave balm, as I expected, completely buries the top notes: for all I know, the manufacturers might not even have bothered to put any in. What it smells like instead is the middle of the scent, which--as I will get to, I promise--is pretty nice. I'm guessing that the quarter-ounce is the real deal, or closest to what was intended. 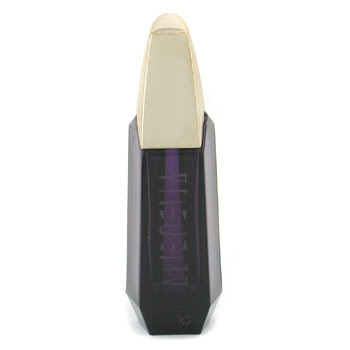 It starts with a bright freshness that isn't quite the usual clean-ozonic smell we expect from modern perfumery (and, I would imagine, are all righteously sick of). Instead, it has a starched crispness to it: it makes me think of fresh laundry. I don't love it madly, but it's better than it could have been, which is a relief. Alongside it is a batch of prickly spices. The core of the scent is essentially anise-scented pipe tobacco, which sounds as if it could become cloying but which never descends into mere warmth, because the spiciness (and a bit of the freshness) remain well into the middle. For some reason, the 100-mL bottle smells different. It could be from a (very) different batch, or maybe it's gone subtly off, but it clearly isn't the same as the tiny bottle. The top notes are attenuated so much that they hardly even register; that bright synthetic laundry-detergent is pretty much absent. More or less unimpeded by that artificial freshness, brilliant specks of spice and of anise--that sambuca note--fly up like sparks and then recede into the dark leathery tobacco. This is the one I like. The notes are, according to the manufacturer and if you care, Cardamom, Sambuca, Barbados Ginger Spice, Nutmeg Extract, Tamarind Vine, Black Basil, Tobacco Leaf, Suede Accord and Liquid Amber. I don't know what half these things smell like (black basil? 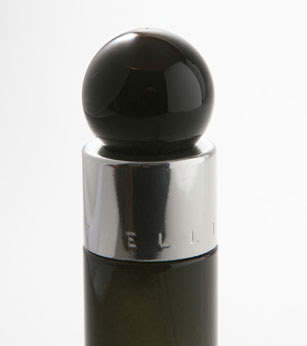 ), but I do know that Perry Ellis 360 Black for Men--the one in the big bottle, anyway--suits me well. It isn't art, but it's pretty good.